The Junior Development Series (JDS) is a series of introductory tournaments aimed for beginner to intermediate players aged 11/u – 15/u across our state and regions of Australia. The JDS tournaments do not offer Australian Ranking points and are played in a round-robin format to maintain a development focus. More information about JDS tournaments. 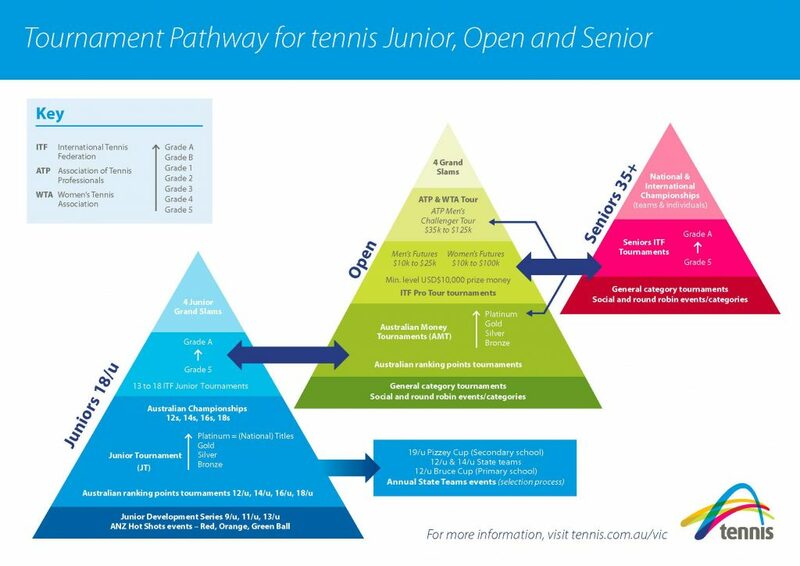 Junior tournaments (JT’s) are separated into four levels of events – bronze (lowest), silver, gold and platinum (highest). Across Australia JT’s are conducted for players (boys and girls) in age groups 18/u, 16/u, 14/u and 12/u. All JT’s in these age groups carry Australian Ranking points depending on level of tournament sanctioning. Entry is open to all juniors subject to the rules and regulations governing each tournament. More information about JT tournaments. International Tennis Federation (ITF) World Junior Circuit consists of over 300 tournaments in 115 countries for players aged 18/u. All ITF Junior tournaments are graded according to the strength of entry from Grade A (the Grand Slam juniors), then Grade 1 down to Grade 5. All players require an IPIN to enter ITF Junior tournaments.National Junior Championships are held in age groups 12/u, 14/u, 16/u and 18/u with limited draw sizes. They are Platinum level tournaments run by Tennis Australia and held throughout the year. Entry into a National Junior Championship event is based on Australian Rankings, whilst some wildcards are also awarded.